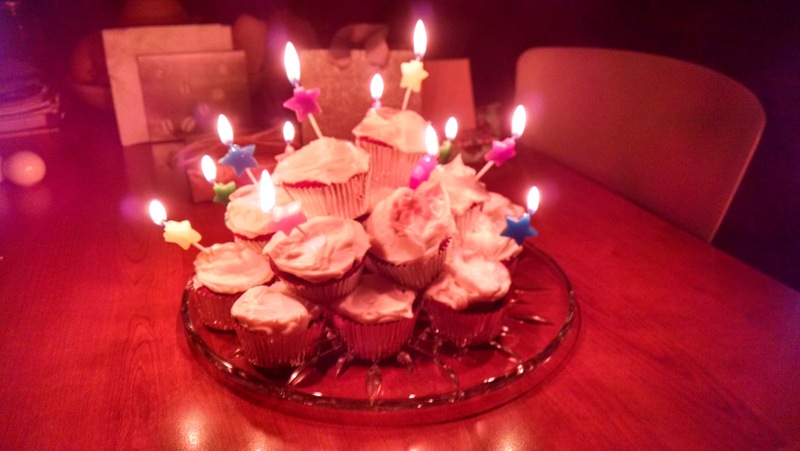 Remember how, at the beginning of 2015, I wrote about changing jobs and going back to school? Well, the going back to school part is finally happening. It's been a long process as I had to wait to get settled in my new job and for there to be enough staff physicians to free up enough time. Then I had to apply and wait for the final confirmation, which was last week. I am enrolled in the Certificate Pastry Program at the Cambridge School of Culinary Arts. Orientation is in two weeks and classes start shortly after. Today was my uniform fitting and I brought home almost all of the equipment. 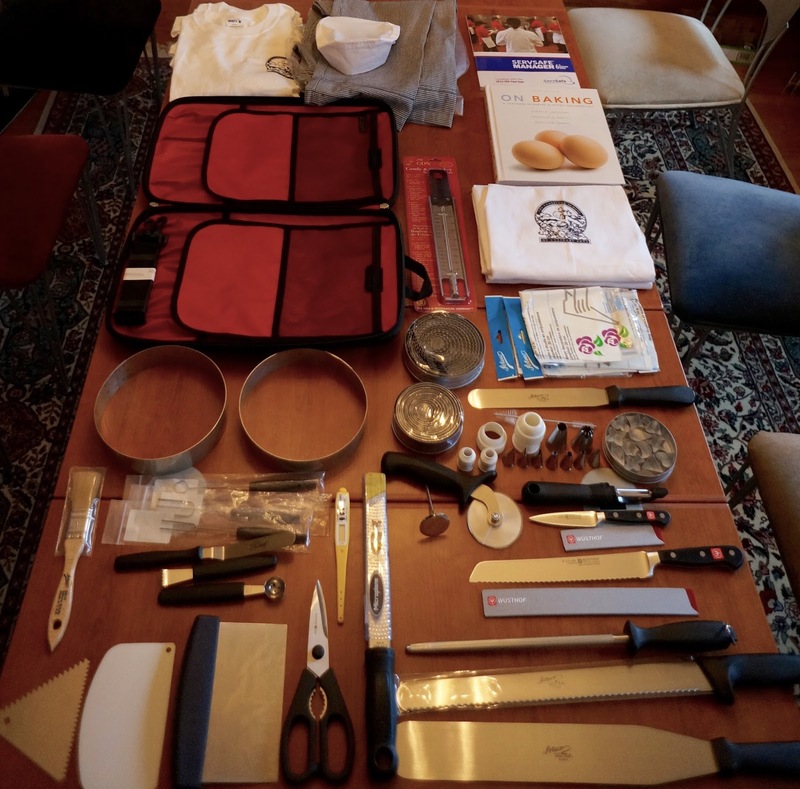 My coats and chef knife will come later but this is the bulk of it. As soon as I have the full uniform I will post a photo. For now, this will have to do. The other day I brought a holiday gift to our mason and his family. It was nice to see him, as always! 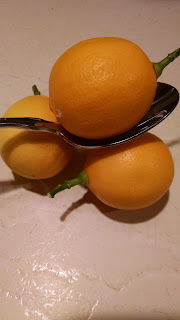 He took me out to the greenhouse and picked 4 tiny Meyer lemons off one of his trees and handed them to me. It was just enough for a half-batch of curd. This morning I zested the lemons and squeezed them, getting 1/4 cup of juice. To this I added 3/8 cup sugar and 1 egg and whisked over a double boiler. Once that was properly mixed, I added 4 T. of unsalted butter and continued whisking and cooking until it was thickened. I now have two tiny jars of curd, about 4 ounces each. I won't be canning them; they can stay in the fridge and I expect they'll be eaten in a few days. The other day it was 65 degrees. Yes, mid-December. All of us in New England are just waiting for the other shoe to drop. It's like we're collectively shaking our heads, saying, "We are SO in for it next month!" However, the bees are probably the most confused. We went to check on them and my husband took some photos of them flying around. I can't tell if they are foraging as there really isn't anything for them to forage. They were flying slowly. Several of them landed on us and just sat on us for a while. They are eating the fondant and likely some of their own honey and are still numerous. There is plenty of fondant left. I have high hopes they will make it through the winter. 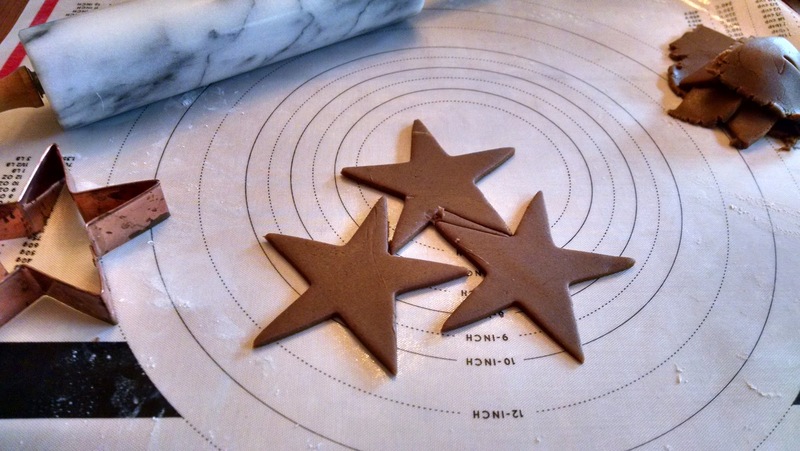 Ever since Lisa sent along this recipe for gingerbread cookies I've wanted to make it. Well, the cookies plus the royal icing are truly an all-morning affair. I think it took me three hours to make all the cookies and ice them. First, the cookies. Lisa said the dough was sticky and she was right. 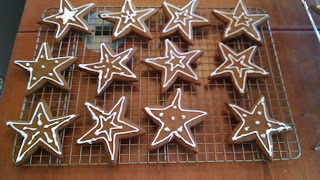 Also, the only holiday-themed cookies cutter I had was a star. 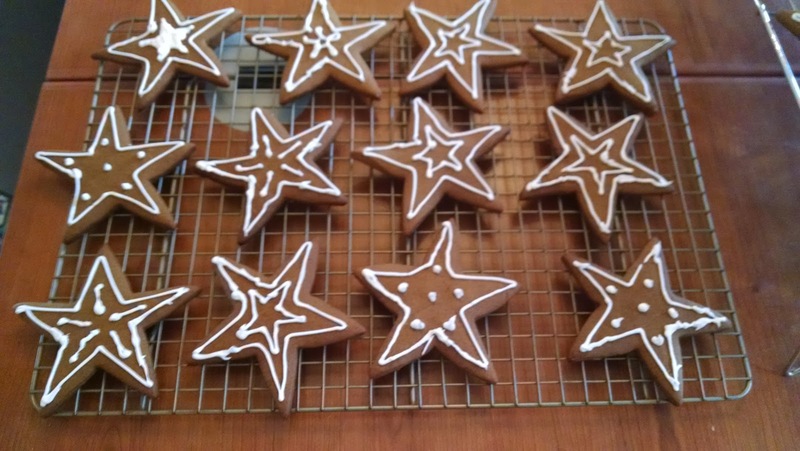 As I didn't have enough parchment paper to make it easier, I needed to find a way to transfer the stars to the cookie sheets. I used a pastry scraper. In the beginning they ended up looking like starfish that were running away from something. As time went on, the dough became a little less sticky and it was easier to transfer them and then they looked more as intended. Also, I baked them for only 9 minutes after the first batch which, thankfully, was the batch that looked like fleeing starfish, came out a little toasty. Some of the more toasty ones became my practice cookies for the icing. The cookies cool very quickly and so I was able to do the icing at the same time. I probably could have used a wider tip on my decorating bag but I have limited options. Regardless, I made many variations on a star pattern and here they are. Why is it not quite right? Well, I'll tell you. I spend a chunk of time this morning at the store picking out little tins that were not dented from a larger supply of very dented tins. Yup, you guessed it. The stars don't fit. If you looked into my spare freezer you would think I have a serious condition with regard to cranberries. I keep buying them when they are on sale and tossing them in the freezer, figuring I'd use them eventually. Well, I think I have 8 bags in the freezer as of today. Fortunately, it's the time of the year for making Cranberry-Rhubarb Compote and filling out the gift stash. My list is maybe a little smaller this year but I'm sure I'll keep coming up with names so I'll likely be back up to the 60+ jars needed in no time. Today's double batch of compote is spiced up with 1/2 teaspoon ghost pepper powder (thanks to Roxanne) and came to a total of 9 half-pint jars. They are processed for 15 minutes in the boiling water bath and then rest for 5 before cooling. This brings the gift stash up to 38 jars. I have enough ingredients for another double batch of this compote which I'll make another day, without the spice. 8:00 am: Get out of bed. Make coffee. Discover we are out of our favorite coffee, the one we have shipped to us 10 pounds at a time. Order coffee. Get the turkey and the stuffing out of the fridge, find the turkey roasting pan. 9:00 am: The brined turkey is now stuffed and will go in the oven at 10. 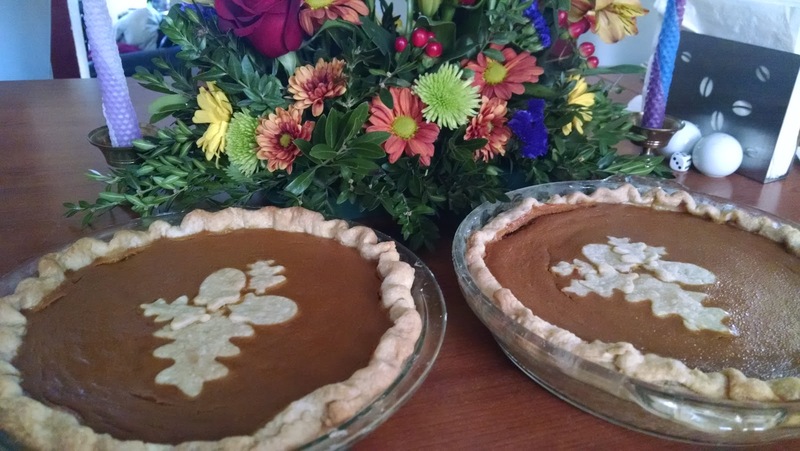 The pumpkin pie is returning to room temperature and is hanging out next to the apple pie (made last night), waiting for their photo op. The rest of the stuffing is in a baking dish. A very large papaya has been cut. The papaya has nothing to do with our Thanksgiving feast, I just felt like buying it. I'll have some for breakfast shortly. 10:00 am: The turkey is in the oven. The pumpkin bread has joined its flashier brethren on the table. Potatoes have been peeled and are waiting in a pot of water until close to dinner. Turns out, neither of my children like papaya. We have a lot left. The dining room has been cleared of all the books, papers, magazines, and random projects that have accumulated there over the last few weeks. The stand mixer's bowl and whisk are now in the freezer for when I need to make whipped cream for the pumpkin pie. 10:30 am: Remember that there is a parsnip to go in with the potatoes. Peel, chop and add. Waiting for the dishwasher to finish so I can get a pot to cook the broccoli in. Usually the creamed broccoli is made days in advance but this year it seemed OK to wait until the day of the party. 11:30 am: Creamed broccoli is made and resting on the stove, over the back burner so it gets the heat from the oven to keep it warm. Dishwasher emptied. 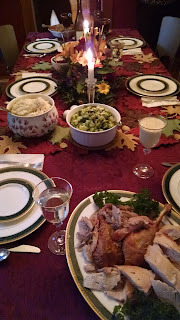 Tablecloth on table, centerpiece centered. I've been told by my Mom not to set the table until she gets here because she has something for it. Holding pattern for now, I guess, but I will get the nice china out and ready. Off to take a shower. 12:30 pm: The china and silverware are out of storage. The foil is off the turkey and the house smells wonderful. 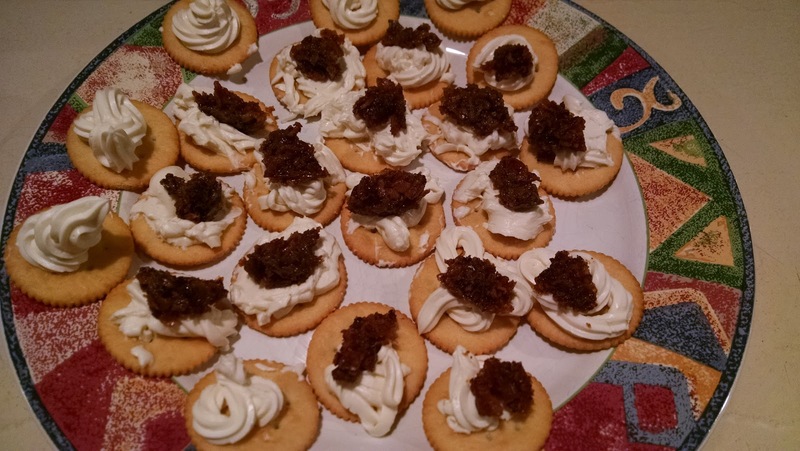 1:30 pm: Made the canapés. Honey goat cheese and cream cheese blended together and then piped onto crackers, topped with bacon jam. 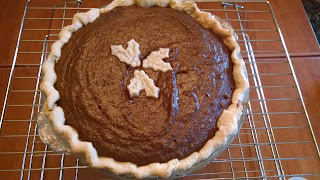 Lesson learned - the disposable pastry piping bags are Not Reliable. 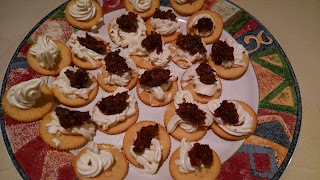 Cheese squirted all over the place so the canapés are not as pretty as visualized. Parents have arrived. New leaf runners are on the table and the table is being set. Potatoes are boiling. Sweet potatoes have arrived and need to stay warm. 2:30 pm: The turkey is out of the oven. I repeat, the turkey is out of the oven! Potatoes mashed. Extra stuffing now in the oven to bake while the turkey rests. 3:30 pm: We are completely stuffed. 4:00 pm: PIE! The whipped cream is made and everyone gets some apple pie and a few people even have room for a slice of pumpkin. 4:30 pm: My parents head home and we start in on the dishes. The dishwasher is on it's third load for today and we're still not done. Time to relax. Happy Thanksgiving! Actually, Thanksgiving. But really isn't it all just about the pie? Today I made 2 pumpkin pies. Since I'm working tomorrow I wanted to take one in and have one ready for our big dinner on Saturday. 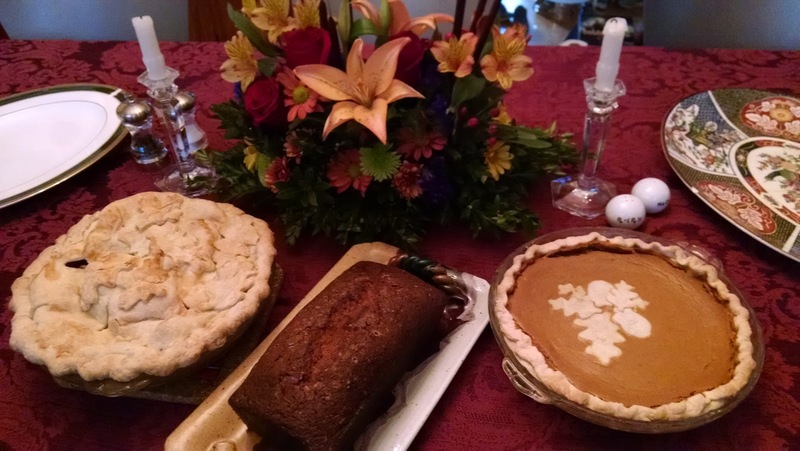 I already made pumpkin bread last week, I'll start the turkey brining tomorrow night, and make the stuffing and the apple pie on Friday. The rest will get made on Saturday morning. It is all under control. It's been getting down into the 20's at night over the past few days and it is time to insulate the hive. When I went out there this morning to do that, I didn't see any bees at all through the window and I got a little worried. I reasoned that since I didn't see a huge pile of dead bees on the floor of the hive they must be in there somewhere. Sure enough, as I was working they started moving around and coming to the window. Fondant boards on the right. First I took the hardware off the window panel and set all that aside. Then I opened the hive and checked on the bees. The honey in the combs looked frozen but I suspect the freezing point is quite low so it was probably just sluggish. Then in order to put the fondant boards in I took out a little bit of wax that was unfilled and not really in the right place. It was so cold it was brittle. 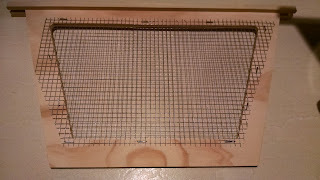 The fondant boards went in and I moved a partly made, partly filled comb behind it. The false back went next and then I added some spacers to make everything fit correctly. After that, I put the foam on top of the lid and then put the panels on the sides. It would have been easier with 2 people but I was able to get the back and side panels on and then I could work on the front. 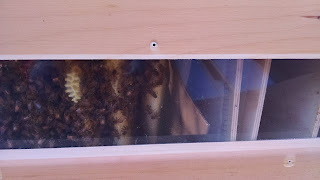 Since the front panel closes up most of the entrance and the bees had started to come out by then, I had to shoo the bees out of the way so I could get the panel on without hurting them. Once I got the bungee straps together I was able to shift the panels into the proper position. Then the roof went on over the top insulation panel. Now that I have the panels up, though, it will be almost impossible to check on them. I have to have faith that they have enough to eat and will survive. 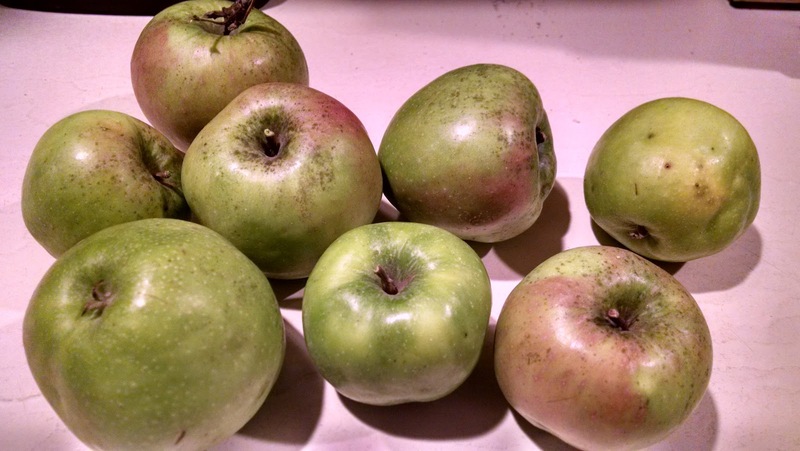 My neighbors across the street have a Granny Smith apple tree and were kind enough to give me some apples. We'd had a conversation a little while ago about how well all the trees did this year and that they were inundated with apples. The other day my doorbell rang and there was my neighbor with some apples! (These are different neighbors than the ones with the apple tree that broke under the weight of its apples.) 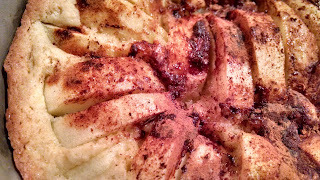 I'd wondered what to do with them and then we were invited to another neighbor's' house for dinner so I thought to make a kuchen with apples rather than peaches. The kuchen base is: 1 stick of butter, 1/4 cup sugar, 1 egg and 1 tsp. vanilla, beaten together, and to which 1 cup flour, 1/2 tsp. baking powder and 1/4 tsp. salt are added. The batter is pressed into a greased springform pan and then the fruit is placed neatly into the batter. Then the fruit is sprinkled with 3 T. sugar and 1 tsp. 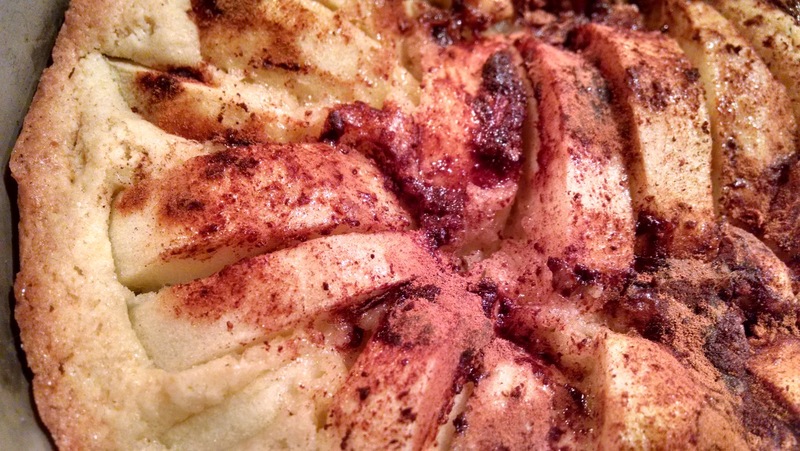 cinnamon and baked at 350 for 30-35 minutes. 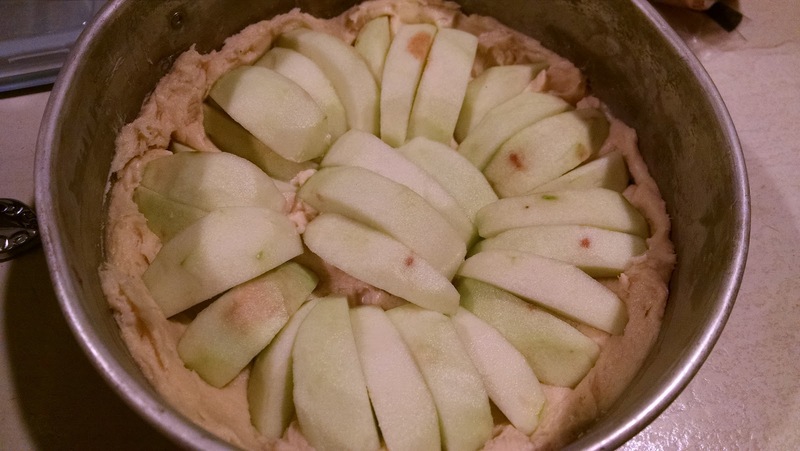 I'd been warned that these apples had a tendency to cook down quickly so I think that the short baking time was better as they held their shape but were still soft. One could serve it with ice cream but it really didn't need it. 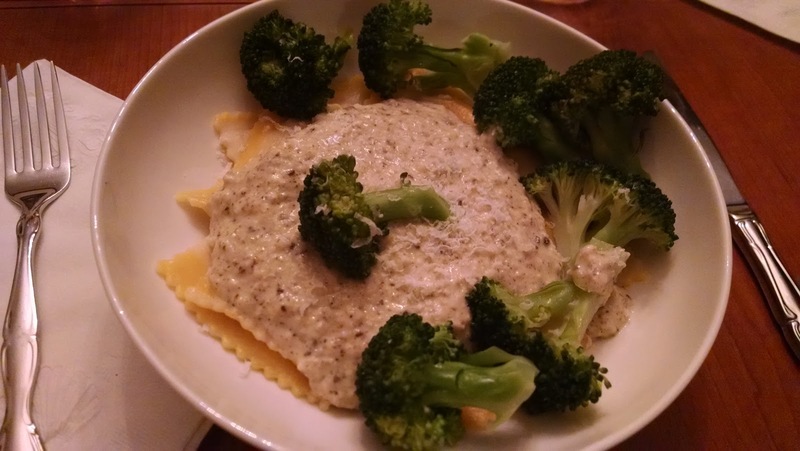 Tonight for dinner we had goat cheese and roasted tomato ravioli with a mushroom cream sauce. And the 10 year old ate it. 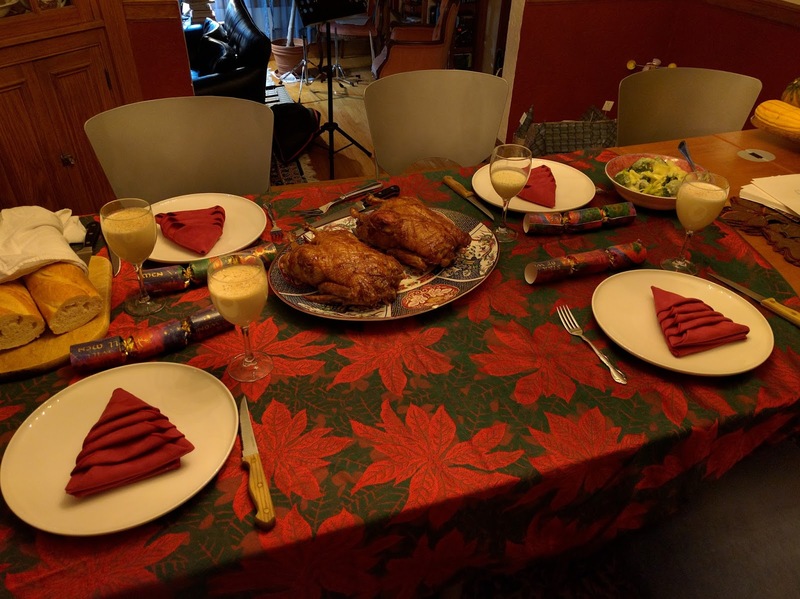 The eggs, cream and mushroom powder were slowly heated (not slowly enough, note-to-self!) with the salt, pepper and nutmeg until thickened. While it was resting I made the ravioli. We've found that the 10 year old's favorite ravioli has chicken in it but if I can't find those, the goat cheese and tomato ones are a good option. I thought the hotplate was as low as it could go but apparently it was still too hot and the eggs cooked a bit. You can tell by the photo that the texture was off. The taste was perfectly fine. If I wasn't trying to keep the mushroom powder a bit of a secret I might have added more. Or chunks of mushroom. But this was just right for today. 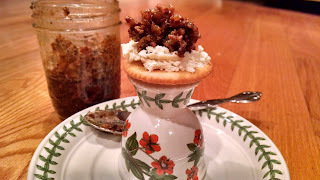 Bacon jam and honey goat cheese. 'Nuff said. As in, cookies for horses. What were you thinking? L-R: First, second and third batches. See the difference in color and shape? Here's where things got interesting. The mix was very watery, but I tamped it down into mini muffin tins and baked for 50 minutes or so at 325. 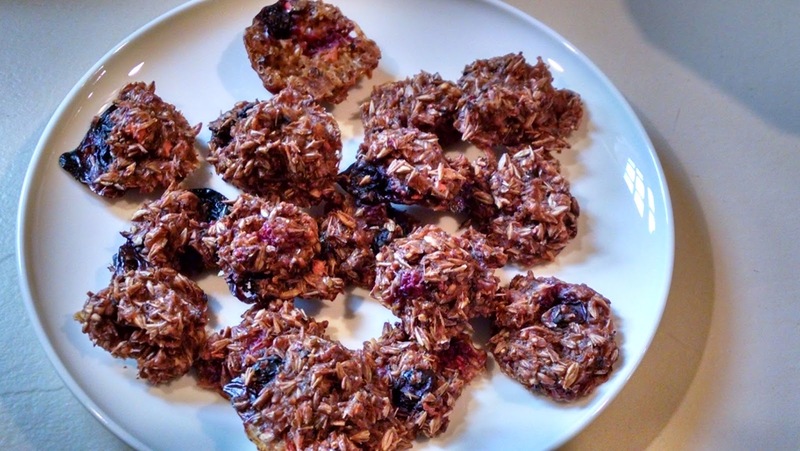 The sugary liquid boiled over and caramelized and the cookies were too soft. While that was going on, I tried a different approach; for the second batch I squeezed the liquid out of handfuls of the mix and placed the little balls on a cookie sheet. Those were baked for 40 minutes. What I found was the first batch was so soft that when I took them out and let them cool a bit, I couldn't get them out of the muffin tins without them breaking. So I took each one, squeezed it into a ball, and put them each onto a cookie sheet and baked them again for about 20 minutes, trying to dry them out. The second round, squeezed out but not in the tins, fell apart in the oven. When they came out I took each one, formed it into a ball again, and put it on the cooling rack. 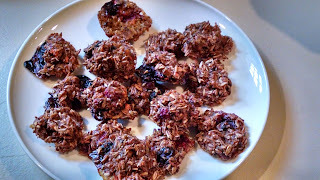 The last batch worked the way I wanted it to: each handful of mix was squeezed out and then pressed into the muffin tins and baked for 40 minutes. Then I turned the oven off and left them overnight to finish drying out. This morning they were the correct shape and consistency. Now I know! 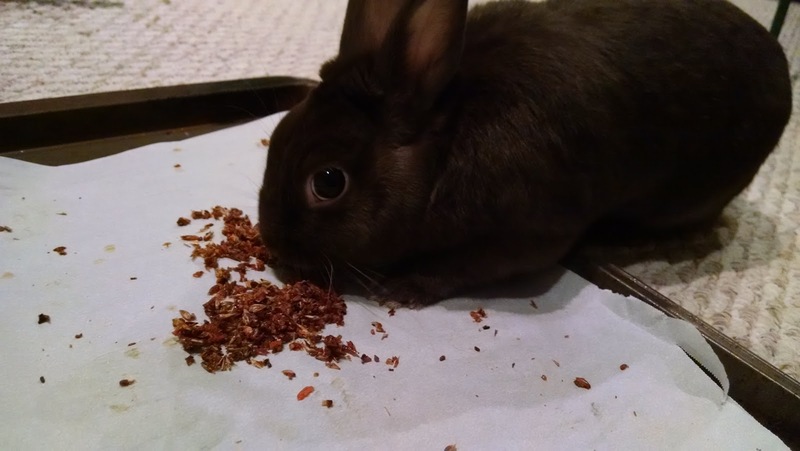 Mocha got to eat the grain crumbs from the second attempt - he can't eat a lot of these because the sugar content is so high, but he certainly approved of them! Yesterday I had a full afternoon available to make soup. I had a fridge full of turnips, carrots and cabbage plus a bowl of potatoes on my table, all from the farm share. This Icelandic Lamb Soup uses it all. Since I had A LOT of turnips I thought I'd make a triple batch of soup. I purchased 6 pounds of lamb and also dug out some frozen lamb bones from my freezer to toss in. This simmered for about an hour and then I added the vegetables. After we had some for dinner, the rest went into the fridge overnight. Today I skimmed the chilled fat off the top and reheated the soup. I was able to fill the pressure canner with 14 pints of soup and I still have about 4 more servings in the fridge. Three batches is lots of soup.... Anyhow, the pints were canned at 10 pounds for 75 minutes and now I have no excuse not to take lunch to work! 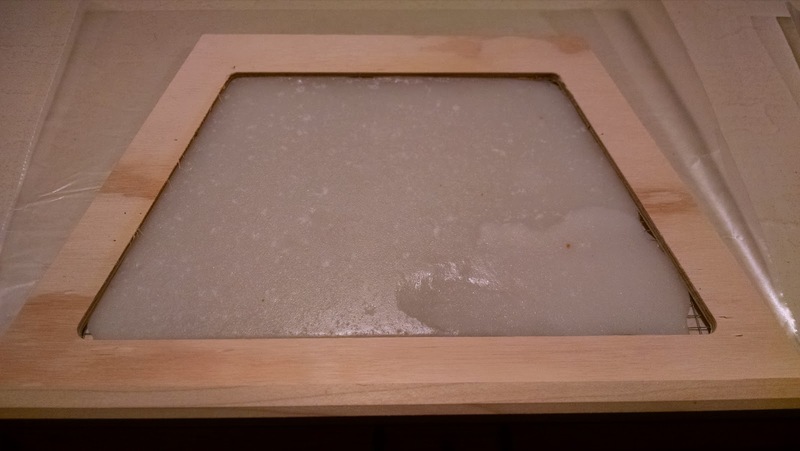 As part of the winterization of my hive, which seems silly considering it's going to be in the 70's today (I know, it's a fluke), I made fondant boards for the bees. Most of the information about making candy boards or fondant for the bees is for Warre or Langstroth hives. 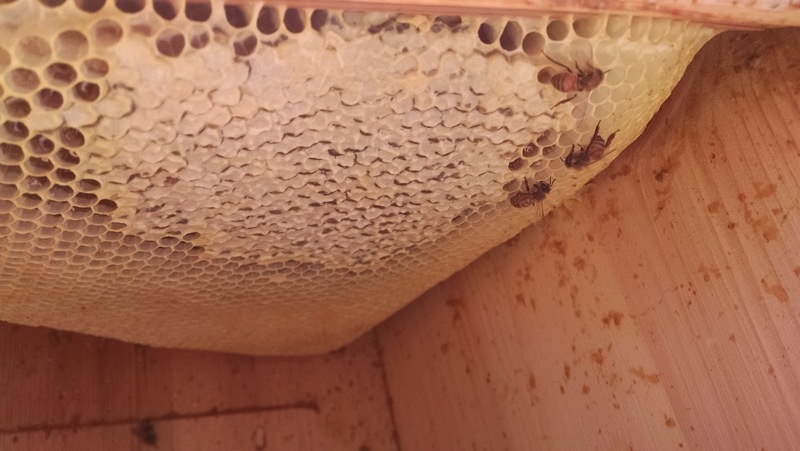 There isn't as much about top bar hives out there, at least not yet! Anyway, some searching online a while back made it clear that since I couldn't put the sugar or fondant on the top of the bars, I needed to have or make some kind of frame and put the fondant inside. That way, they could hang with the combs. First I went back to the company which made the hive. I purchased 2 combiner boards which look like false backs but with a big hole cut out of them. 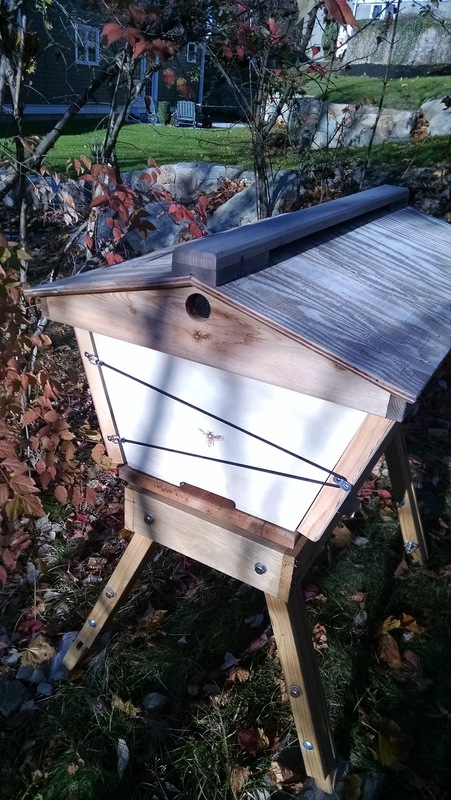 These are generally used to combine two colonies in one hive. I thought I could repurpose them for candy boards. This morning I made fondant based upon this recipe: How to Make Fondant From Table Sugar. I cut the recipe by 1/4 so I used 2.5 pounds of sugar, plus 1 cup of water and 3/4 tsp. of lemon juice. Once the syrup had cooled to 200 degrees, I added a teaspoon of the bee essential oil mixture and put it in the stand mixer for a while, until it was white and smooth. Then I poured the fondant into the two molds. The amount I made was perfect for the 2 boards, which I had hoped would be the case but one never can tell. When it's time for me to put the insulation panels on, in about a month, I'll pop these in as well. Preserved garlic which was, by far, everyone's favorite. Sweet Fiddlehead pickles. I'd brought 2 jars, we finished 1 and didn't open the second. Popular. Bread and butter pickles, which also got some rave reviews. Zydeco beans, nice and spicy. Salsa verde, not as popular. I suspect that if I'd had the right chips to go with it the jar would be finished. Crabapple jelly; people who like apple jellies liked this a lot. Elderberry jam which was my husband's favorite, I think. Strawberry Lemon Marmalade; this one surprised me at how much the lemon flavor stood out when compared to when I first made it. It was very popular. It's nice to get some feedback from people who don't often get to eat the foods I prepare. Since the younger child will eat all things poultry, even if they contain "flavor," I decided to make chili with ground turkey rather than beef. Simmer for several hours. I decided not to add jalapeños or any extra spice and I am pleased to report that, except for the beans, the younger child did eat it. However, the bread boule was the larger portion of dinner. We topped the chili with shredded cheese, sour cream, and some chives/field garlic from the yard. There was enough left over to can 2 quarts of chili and leave some in the fridge for meals this week. The chili was canned in the pressure canner for 90 minutes at 10 pounds. 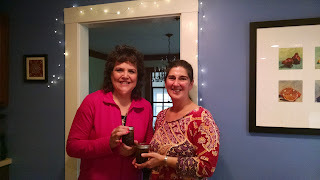 Roxanne and Donna and our bacon jam! Spread half of bacon in a single layer in a large skillet and cook over medium heat, stirring frequently, until browned, 20 to 23 minutes. Transfer to paper towels to drain. Remove fat; clean pan. Repeat with remaining bacon, reserving browned bits and 1 tablespoon fat in pan. Add shallots and garlic to pan and cook over medium heat, stirring, until translucent, about 5 minutes. Add chili powder, ginger, and mustard and cook, stirring, 1 minute. Increase heat to high; add bourbon and maple syrup. Bring to a boil, scraping up browned bits. Add vinegar and brown sugar and return to a boil. Add reserved bacon; reduce heat to low. Simmer, stirring occasionally, until liquid reduces to a thick glaze, about 10 minutes. Transfer mixture to a food processor and pulse until it has the consistency of a chunky jam. Refrigerate in an airtight container at least 1 hour and up to 4 weeks. However, instead of refrigerating the jam, we put it into jars (note to self, that whole recipe makes only 3 cups of jam!) and pressure canned it at 10 pounds of pressure for 75 minutes. I have one jar, Roxanne has one jar, and she is sending the third to someone on a cooking show to see if he likes it. I'm sure he will, it's really good. It's been really cold this weekend, below freezing at night, and I wondered how the bees were doing. Both days when I checked them they were staying put in the hive. It's the first time I've been out there and not seen them flying around. 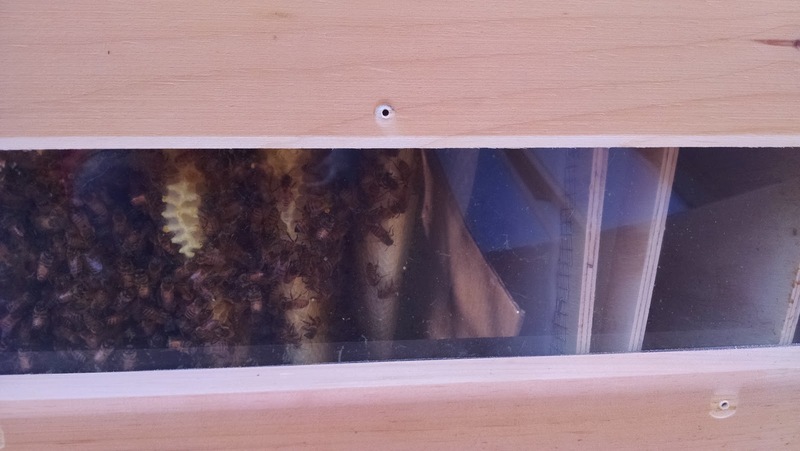 This morning it was cold enough that they had pulled themselves into the middle of the hive and I was finally able to get a good look at the comb from the window. If you look closely at the photo you can see honey all the way out to the edges and many capped honey cells. This is a Very Good Sign. All the combs I could see through the window looked like this. I will still make them some food to add in when I put up the insulation panels (more on that later, when I make the fondant) but I'm feeling better every time I check that they'll actually make it through the winter. Where Could I Have Put It? Last time I made yogurt from starter, I had several packs of bacteria in the freezer specifically for it. As I haven't made yogurt in a while I figured I'd start up a new batch. I got the milk, heated it up, and started to look in the freezer for the starter. It wasn't there. I tore apart both freezers in between stirring the milk. Nothing. I found all my other cheese-making bacteria, and got a pretty good inventory of what I do have in the freezers, but did not find the yogurt starter. I have no clue where it went! While the milk was sitting on the stove at 170-180 degrees, I ran to the store to get a container of Skyr to start the batch. It's not my favorite but it's reliable and it'll do until I find the packages of starter. Which I'm sure I'll find, now that it's not urgent that I do. Running to the store is a little complicated these days, as they say they're going to do the final paving of our road today and I had to park the car far away. And put it back in its far away spot when I was done. Now, where could I have possibly put that package? Yesterday's farm share pick up was heavier on the squashes and fall greens, lighter on the tomatoes and beans. Here's what I brought home: 1 head each of lettuce and escarole, some braising greens, as much kale as I could carry (the greens and kale are going to Mocha), 1 qt cherry tomatoes, 1/2 pint raspberries (which is impressive, considering how late in the season it is), 2 butternut squashes, 2 acorn squashes, 1 delicata squash, 2 heads of garlic, 3/4 pound carrots, 1 bunch Hakurei turnips, 1 bunch broccoli, 1/2 peck apples, and I didn't bring home the purple top turnips, herbs, Daikon radish and green beans. The beans and all the herbs, tomatoes, tomatillos and hot peppers are, at this point, whatever you can glean in the fields and, while it was a nice day to be out picking, I just didn't feel like I was going to get enough to make it worthwhile. I'm still working through last week's farm share too. I have 2 big bowls of squashes on my dining room table, along with a bowl of popcorn that is finishing its drying out time before we can pop it (January). I plan to make some escarole soup on Thursday. Last night for dinner I served the raspberries and also used up the green beans and potatoes from last week. My younger child doesn't like potatoes in any form other than potato chips, so I made one potato into very thinly sliced chips and served the rest mashed. The chips were almost too thin, I used the 0.5 mm thickness on the mandolin, so maybe 1 mm would be better? After I left the farm yesterday I went up to the fairground to pick up my entries and my ribbons. I was also picking up everything Roxanne had entered. It's a good thing I brought a bunch of boxes. I had to make 2 trips to the car with another person helping me! She entered a LOT of things. It is always so strange to see the fairground when it is empty and things are being broken down or boarded up until next year. It looks like the bees are judging the drone! This morning I used a half-peck of apples to make 3 quarts of applesauce which are in the canner. I am still deciding what to do with the Daikon radishes - what I want is those yellow radish pickles I can get at the Japanese and Korean grocery stores. 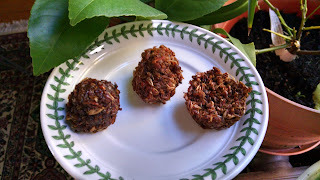 But I'm not really finding recipes for those although I think they are the rice bran pickles. Not sure. What I am finding are recipes for carrot and radish pickles and I have another recipe for pickled radishes or Hakurei turnips. Maybe I can mix the two together, but I have a LOT of both and that would be way too many pickles for something I can't even put in a canner. Fortunately, they'll keep while I figure that out. The fridge is definitely more manageable now, with space to actually see what's in there. 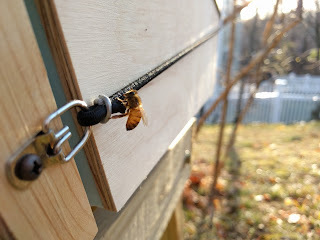 Just now I went out to take out the feeder from the hive. The bees are more active now and I think I saw a drone get evicted. I did have bees all over my clothes and in my hair again, but they didn't seem to really care about me all that much. 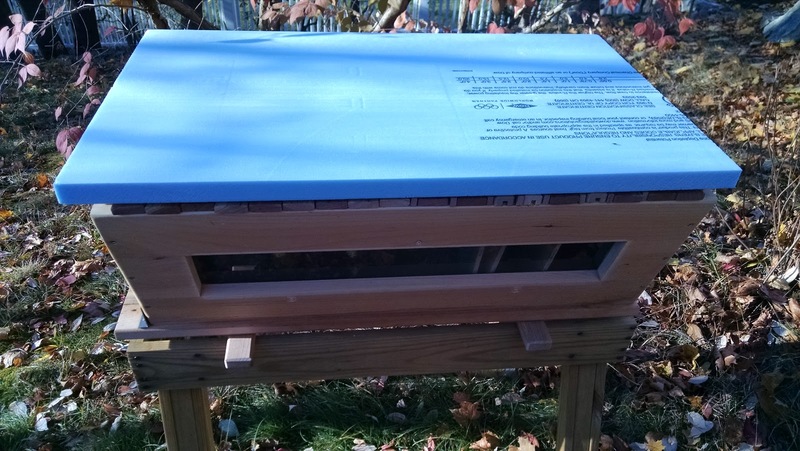 There is definitely honey in there, but I will be making some sort of sugar cake or fondant before Thanksgiving so I can include some when I put up the insulation panels. There have been a few projects I've been saving up so I could work on them while I waited for the boiler maintenance service today. First of all I made a batch of hot pepper sauce, using about 25 banana peppers, a few jalapeños, habañeros, and Thai peppers. These were ground up with 1 pint of vinegar, then boiled with 1 pint yellow mustard, 3 cups of sugar and 1/2 T. salt. 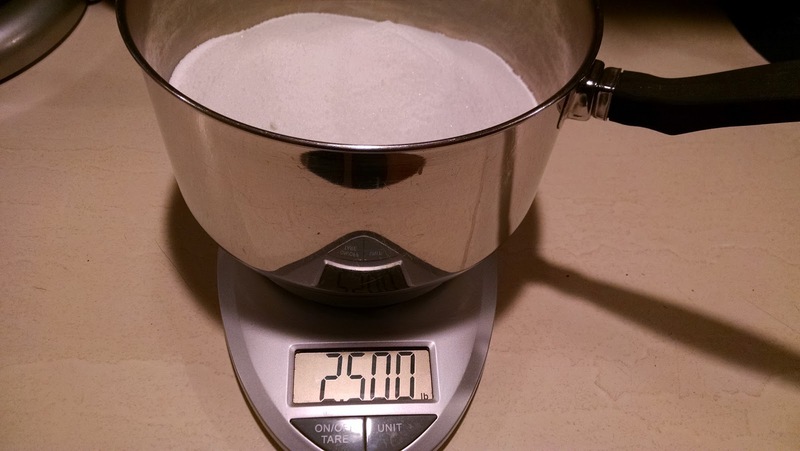 Once the mixture boiled, a small amount of flour and water was added as a thickener. I ended up with 7 jars, all different sizes, or about 8 cups of sauce. The other project for today was pickled beets. I had some golden beets in addition to the usual red ones and made 3 quarts of pickled beets. In previous years, the random golden beet would look ghostly in the jar. This time, I put all the golden beets into one jar so they wouldn't look as weird. Other projects for another day: applesauce and something with the Daikon radishes I have from the farm. Then I'll be caught up for a little while, at least! As the farm share is winding down for the year, there are fewer of the "summer vegetables" and more winter squash, potatoes, kale and other late greens. It's a good bet I won't be getting any more monster zucchini so I took my last two and made another double batch of chocolate zucchini bread. I think we'll have one for breakfast and I'll take one to work, leaving another 2 for the freezer. Eventually I'll move on to pumpkin bread but, for now, I have to clear out the vegetable drawer. Also today I shelled and toasted all the black walnuts. This yielded at least a cup, if not a little more, of nuts. Last year I put them in maple syrup, we have used the walnut-infused syrup but haven't eaten the walnuts. I might put these into applesauce again, or maybe I'll find some baked good in which to toss them. Lastly, I had lunch with Roxanne today and brought home some of her home baked goodies that she'd made for the fair. The cookies were especially wonderful! It's clear to see why they won first place. Yum! I know what my husband is really saying in this video: "WHAT are you THINKING?" Great Day at the Fair! It's a really cold day for the Fair, but that didn't stop us from heading up there to see how I did with all my canning entries. I'm so pleased to report that I won a ribbon in every class I entered. There was even some consistency in that 2 of the items were also entered in the Fair last year and they won the same place each time. I am also pleased that my friend Roxanne won lots of things, too, including the gift basket category; her basket was just beautiful. And she won not just in canning but in baking as well - cookies and cake! After work I went to the farm to pick up the share. Hard to believe there are only 3 weeks left! Here's the flora part: 1/2 peck apples, 1 bunch flowers, 1 watermelon, 2 each acorn and carnival squashes, 1 head of lettuce, broccoli, arugula, beets, radishes, purple top turnips, Hakurei turnips, zucchini, garlic, hot peppers (I could only find 5, they're basically done for the season), lots of kale, tomatoes, parsley, 1/2 pint raspberries, green beans, and popcorn. I now have 3.5 gallons of tomatoes in the freezer and a bunch of projects for next week. For dinner we ate the green beans and had a salad along with our steak tips and pasta. And more cupcakes. Now for the fauna: while I was at the farm I saw several field mice and heard even more. I startled a little mouse in the green beans and it ran in 3 different directions, clearly flustered, until it finally picked a direction to get away from me! When I got home I went out to feed the bees. This is the last time I'll put in a jar of syrup; when they finish it I'll take the whole feeder out for the season. While I was out there I heard something rustle and looked over to see a fox about 50 feet away from me. A big one, too! Keep in mind, I live in a fairly urban environment. Others who have seen the fox lately theorized that all the construction has disrupted their habitat so they're more active and visible. Lastly, I saw a bunny in the middle of the road while I was driving (no worries, he got out of the way). Lots of critters! My neighbors with the apple tree had asked if I wanted more apples. Why yes, yes I do! So I stopped by today with a jar of apple jelly from their tree for them, met their wee new granddaughter, and then picked 6 pounds of apples just from the branches hanging over their driveway. When I got home, I chopped them in half, cooked them with a little water and then ran them through the food mill. To the sauce I added about a cup of brown sugar and some cinnamon. They're currently in the canner: 2 quarts and a little more for me. 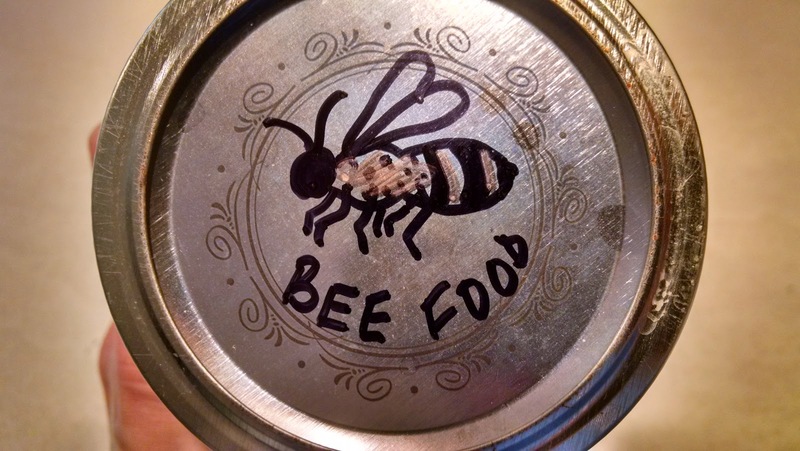 Also today I swapped out the bee food jar. The bees were a little more active today, one even landed on my leg (oh, yes, I was without the protective gear today) and made me a little nervous but soon left. There were about 10 bees attached to the lid of the jar, I managed to swap the lid to the new jar of syrup without disturbing them too much; they were still on the lid as I put the jar back in the hive. All in all, a relatively quick and certainly painless bee tending experience. With yesterday's farm share pick up, my vegetable drawer is rather full. Since we just can't eat that much, it's time to start making things with the veggies. First up, a batch of caponata. For this I had 2 eggplants, so I scaled the recipe up by 1/3 and used 4 peppers (instead of celery), 4 small onions, 4 tomatoes, and the last of my Kalamata olives. I didn't have any green olives for this batch. This made 3-1/2 pints of caponata and I'll take one jar to my parents' tonight. The next thing was another 2 quarts of green beans, which are currently in the canner in 4 pint jars becoming "Zydeco Green Beans." Essentially, they are dilly beans without the dill. Instead, there is garlic, mustard seed, and a chili pepper in each jar. The farm share is a bit out of control: 1 spaghetti squash, 1 pound of carrots, 1 bunch of beets, 1 head of lettuce, 1 bowl of arugula, 3 heads of garlic, 4 onions, 8 peppers, 2 quarts of green beans, 1 bunch parsley, 2 quarts blackberries, 1 quart peaches, 2.5 pounds of summer squash, 30 leaves of kale, 1 quart cherry tomatoes, 2 pounds of regular tomatoes, 8 tomatillos, and I didn't even get the flowers, husk cherries, basil and seasonal herbs. As soon as I got home I made a salad for dinner, used some of the tomatoes and onion in our enchiladas, and baked a peach and blackberry crisp. Which was dessert and breakfast. The berries had been too squishy to eat straight so I needed to bake with them. I contemplated a peach-blackberry jam but the crisp seemed a better option. I've been keeping an eye on the bees, and have made a pint of "Bee Food" concentrate: sugar, water, lecithin, lemongrass oil and spearmint oil. This is added to the sugar syrup, 1 tsp. per quart. When I replace the quart jar tomorrow afternoon, that will be the first time they get it, hopefully they will like it. It's supposed to give them some essential nutrients. From one 9-pound batch of free apples I made: 12 cups of apple jelly, 2 quarts of applesauce and 1 quart of sweetened apple juice. Not bad! I plan to enter the apple jelly in the fair so for fair purposes: 7 cups prepared apple juice (9 pounds apples, 9 cups water, simmered and then strained through cheesecloth), 9 cups sugar, 1 box Sure-Jell pectin. Prepared the usual way, processed for 5 minutes. For the applesauce, I took the leftover pulp from making the juice, ran it through the food mill, and added about 3/4 cup sugar and 1/2 cup honey. I feel very frugal, having made all these things from one gift of apples. Speaking of fruity gifts, the peach crisp was lovely for breakfast! I also started the kimchi fermenting this morning. The cabbage was drained and the brine saved. Then the cabbage was mixed with scallion, ginger, red pepper, salt and sugar and packed into a 2 quart jar. The brine was poured over the top and then the rest of the brine is in a ziploc bag in the mouth of the jar to keep the vegetables below the brine. Shouldn't take more than a few days to ferment. I have warned my kids about the smell. I am too tired today to get to the green beans, maybe tomorrow! What I did have the energy for was to go "bar by bar" and inspect my hive. What I found was a little disheartening. 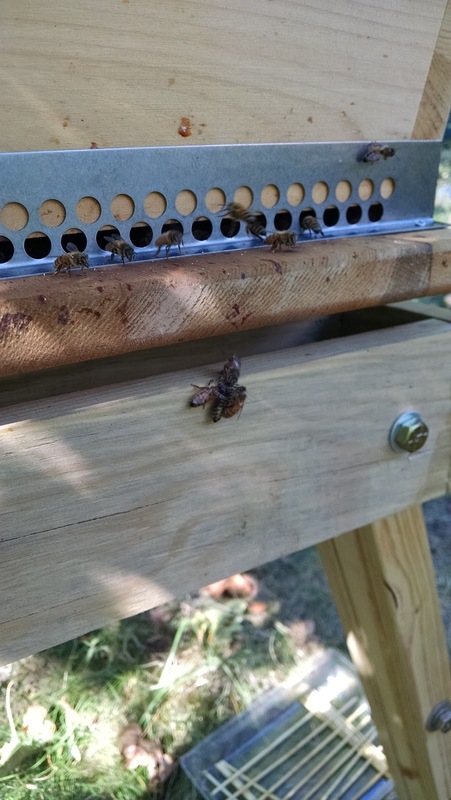 There were plenty of new bees, larvae, and pupae, but almost no nectar and no honey stores. I got worried and emailed my beekeeper friend. She suggested I feed them from this point forward as there isn't a lot of nectar around right now and they're going to need it. 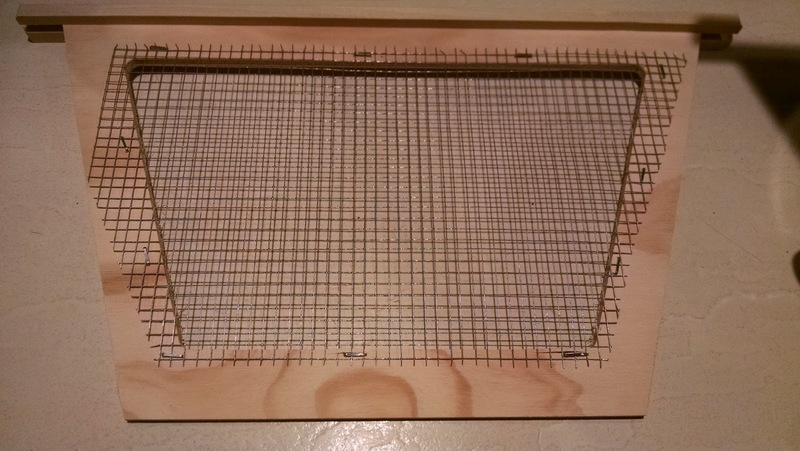 I have an idea to make an easy feeder so I'll work on that tonight and set it up tomorrow. That way I won't have to feed them every other day. I was able to completely disrupt the hive by moving every single comb without getting stung so that's good, at least. I would have a video to share except that I don't seem to know how to work the GoPro. Next time. If it seemed in my last post that I had a lot of things going on, well, they just multiplied! Continuing the theme of an epic year for fruit, my neighbor's apple tree, which they had in recent years pretty much given up hope of saving, had so many apples on it that one of the limbs broke off from the weight. She offered me as many apples as I wanted, so I got about 9 pounds yesterday and proceeded to simmer them with water to make apple juice. I let them strain overnight in the fridge and the plan is to make apple jelly and maybe applesauce with the leftover pulp. Which I would have done today except for the peaches. At work today there was a bag of peaches with my name on it! The nurse with whom I swap jam for eggs had been picking peaches at a friend's house and very kindly thought to bring me some. There were enough little peaches to make a batch of jam (since I didn't have almonds I added a teaspoon of almond extract after the hard boil, but each jar does have a maraschino cherry - homemade, of course) and a small crisp. I will bake the crisp in the morning for breakfast, right now the peaches have a little sugar and lemon juice on them and are waiting for the topping. Also today, I picked up my farm share. I still have a quart of green beans left over from last week, and picked another 3 quarts. I think I might try pressure canning them, in case they taste better than beans in the metal cans. Hopefully I can get to that tomorrow, in between checking on the bees and making all the apple jelly and sauce. And kimchi. Did I mention I started a batch of kimchi? No? Well, that too. Bees: they are doing well. It appears they are about 1/3 through another comb. 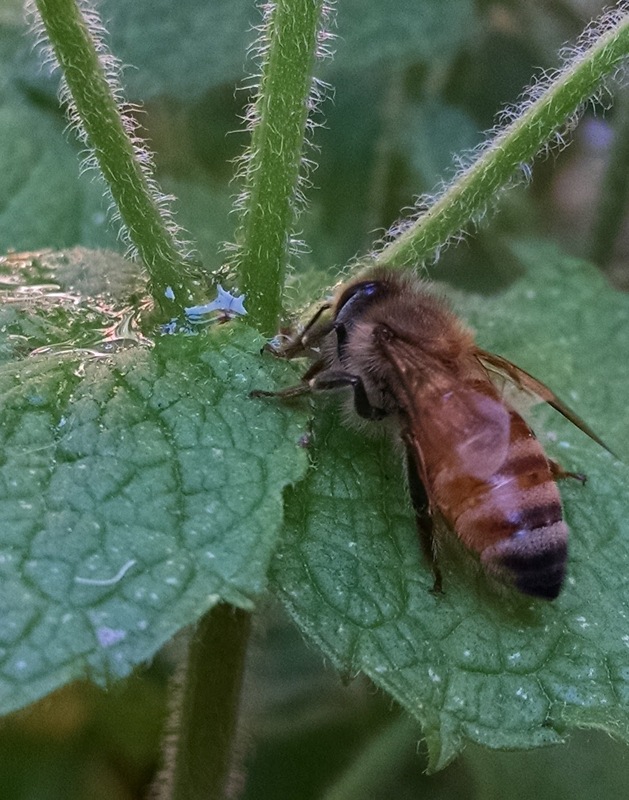 There are so many bees out foraging that they arrive back at the hive at a rate of about 3-4 bees per second. The pollen they carry ranges from white all the way to a deep olive green, which might be an aster species. 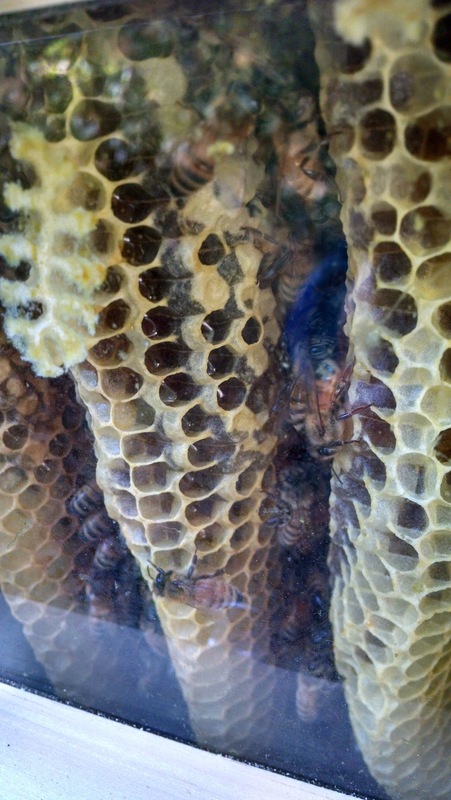 I'm worried, though, that they won't have enough time to build up their honey stores before the fall. Unless something amazing happens in the next month, I will likely have to feed them over the winter. Grapes: while we were at the Y last week I noticed some tiny wild grapes. This week I picked about 1.5 pounds with the help of my younger child. 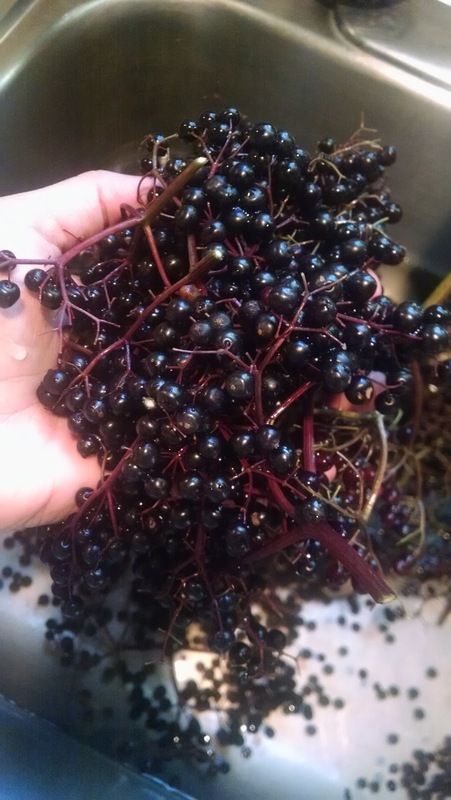 While not enough to do anything with at the moment, they are washed and in the freezer waiting until I have at least 3 pounds so I can make jelly. Cornichons: the recipe for these said they would be ready in a month, so I made a date on the calendar for today. I thawed some paté and spruce paste and we had that, with the cornichons, cheeses, bread, grapes, and chilled steamed green beans in a vinaigrette, for our dinner. They were spicy and crisp, mmm! The grapes were weird - elongated pointy things called "Witch Fingers." Have you ever seen them? Well, as I've previously mentioned, I'm a sucker for unusual foods or if they have limited availability. They taste like any other grape. Which is a good thing. 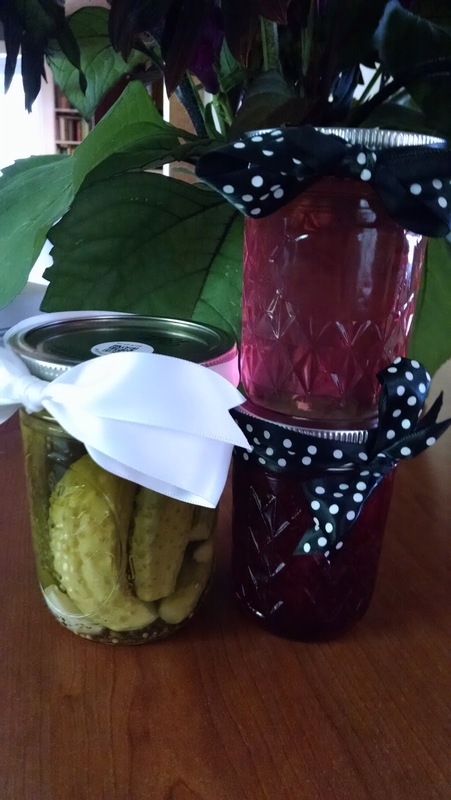 Pickles and jam ready to be gifted. Wintergreen ice cream: I made brownies today, partly for us and partly for the guys who are still toiling away on our water main. This morning they started to work in front of the driveway before I knew they were there and so I had to go rushing out and ask them to stop long enough for me to get my car out. They were kind enough to do so (my heart sank as I ran out and watched the backhoe take a huge bite out of the pavement...but not so much that I couldn't get my car over it) and I reciprocated with lemonade and brownies. As before with the zucchini bread, the empty plate and pitcher were at my door within about 2 minutes. Anyway, we had brownies and wintergreen ice cream for dessert. Gifts: we have two sets of new neighbors, next door and across the street. I brought each of them a few of jars of jam and pickles. I hope they feel welcome. Moving to a new place can be pretty overwhelming! "Blueberries. You need more. When nature cooperates, you should stock up. Go get more." The trouble has been finding the time and a willing helper-child. 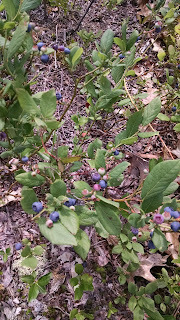 Our weekends have been filled up with work and travel so any trips to the blueberry patch would have to be on weekdays, and I have somehow managed to book my weekdays rather full. The kids have been at camp and then home and, because they were at camp, not so excited to leave the house again. Today I managed to make enough variables come together; I got out of work early, the weather was good, and the elder child was willing to go with me. 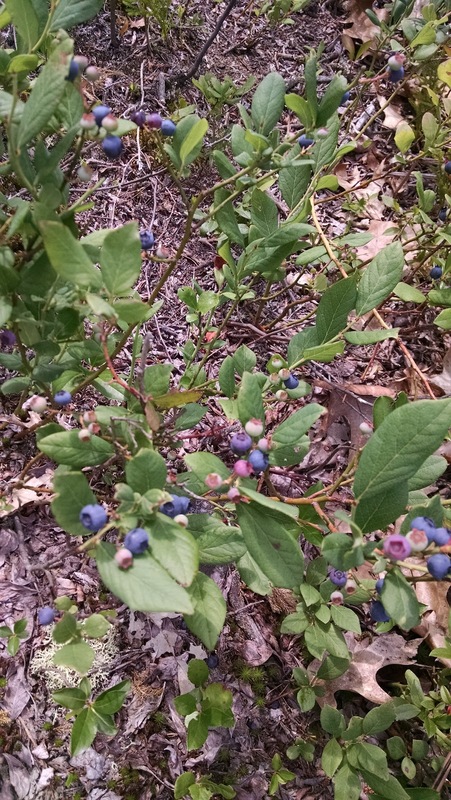 We got to the blueberry bushes around 3 pm and left at 5. In that time the two of us picked 2 quarts of berries. In basically the same area we were at before, and not really having to move around at all. They are still so plentiful, and even sweeter than before. Must have been all that sun. After consulting with my kid we decided I should make another batch of jam rather than put them all in the freezer. There were enough berries to do that and add 2 small bags of berries to the freezer stash. Now I'm on the lookout for elderberries. I'd like to make some jelly this year. The jam was too seedy. They should be ripe soon. Yesterday I mixed 6 cups of cucumbers, 2 cups of red onions (Red Long of Tropea, to be exact) and 2 cups of chopped green bell peppers with salt and let it all sit. Today I drained the veggies, mixed up the spices, sugar and Clear-Jel with vinegar and brought it all to a boil, then added the veggies, boiled again, and put it into jars. I used 5 8-ounce jars and 7 4-ounce jars, so I could start this year's gift stash. Also, I started another gallon of yogurt. I've lost count, this is either batch 6 or 7 from that original packet of starter. It'll be ready tomorrow. While I was getting the already picked items, it was getting darker and darker and thunder was rumbling. I was told it had been rumbling for over an hour, so I figured I still had time. I went out to pick 2 quarts of green beans. The lightning was getting closer and closer! Just as I was finishing with the beans, the first large drops began to fall. Most of them missed me, they were so sparse. I started walking to my car, wondering if I could get the 1/2 pint of blackberries or maybe some dill flowers. By the time I got to the dill field the drops were coming more frequently. Halfway back to my car, the sky just opened. Whoosh. I was soaked in 3 minutes flat. Once in my car I drove home, wondering if I was going to end up like those people you read about who have a tree fall on their car. They were really waving around in the wind! Fortunately, I made it home without incident and, by the time I got to my town, the rain had stopped. My husband wasn't as lucky; he was about to head home on his bike when the hail arrived. He ended up taking the subway. After dinner I made 2 pints of dilly beans with 1 quart of the green beans. The other quart will be for dinner tomorrow night. For tonight's dinner I was able to use most of the farm share in the form of potatoes and salad. All that is left are a few cucumbers and carrots, one bell pepper, a head of garlic and some cabbage. Where did the rest of it go? Into a batch of golden pickle relish, the same recipe which won first place last year in the Topsfield Fair. (For fair purposes, 6 cups cucumbers, 2 cups green pepper, and 2 cups red onion.) The vegetables are resting with salt until tomorrow and I'll finish the batch then. In addition to our weekly farm share, sometimes our mason drops by with vegetables from his fabulous garden. Usually zucchini is one of the things he brings (along with celery, green beans, basil, tomatoes, peppers and sometimes eggplant - it's really quite wonderful) and they're generally the very big ones. Each one makes about 3 cups of shredded zucchini, which means they are perfect for chocolate zucchini bread. Since I had 2, the other day I made a double batch - 4 loaves. Do you know why this recipe is so great? Because the 10 year old asks me to make it. Knowing full well there is zucchini in it. One loaf went to my next door neighbors who had just returned from a month away. Another went to the construction workers in front of our house. They are replacing the water main on our street with a new 3-foot diameter main, complicated by old pipes, traffic, heat, and the fact that the entire neighborhood is mostly ledge. For the past week I've had to either make a date with them to leave my driveway or get my car out really early and leave it out on a side street all day. Anyway, they've been super nice. I brought a loaf of the bread to them, and said they could leave the plate on my steps when they were done. Not TWO MINUTES later, the foreman appeared at my door with an empty plate. I was highly amused. The other two loaves were for us, and one was finished that day - eaten for both breakfast and dinner. See, it's a vegetable, right? So it's perfectly fine for dinner! Last night we'd stopped by the local peach farm so I bought a quart of "seconds" as well as a quart of peaches for eating. I made the seconds into a peach cobbler which we ate for dessert. (Note to self, use the 9x13 dish, not the Corningware.) We tried it with the spruce ice cream - not bad, but I think I might like to try it with the wintergreen ice cream instead. If there is any left by the time I get home from work today! This week, I needed to get the farm share early. We are still working through last week's share, but there's not too much left. Mainly just the greens, which take time. Today's share consisted of another head of garlic, 2.5 pounds potatoes, 1 bunch carrots, 1 bunch spring onions, 2 pounds zucchini, 3 pounds cucumbers, 4 turnips, a head of fennel, and some flowers. First thing I did when I got home was start a half-batch of bread and butter pickles, using almost all the cucumbers, the spring onions and 2 heads of garlic (I had one from last week). After dinner and their 3.5 hour soak in salt, I made the pickles, using the same recipe for "Old Fashioned Bread and Butters" on page 95 in The Joy of Pickling. For fair purposes, as I intend to enter the 2 half-pint jars in the fair, there were 7 pickling cukes (just under 3 pounds), 2 heads of garlic and 5 spring onions (10 oz). Last year, we missed blueberry season by being out of the country. A reasonable excuse, but it meant that we were close to running out of wild blueberry jam. As in, we had one jar of sauce and no jam left! Overall, this year has been fantastic for berries, and the blueberry patch was no exception. I think it has to do with how harsh a winter it was combined with the really beautiful weather we've had in the last month. Every different tree seems to have gone crazy with their respective seeds, fruits or flowers. In the past, we've had to roam all over our preferred picking area for 3-4 hours to get 4 quarts of berries. Today it took us 2.5 hours and we hardly moved; I think we stayed in a 50 foot by 50 foot region. We filled our containers all the way to the top, so in all we netted about 4.5 quarts. Getting up so early in the morning not only beats the heat of the day, but because there are fewer people around, you can hear the birds and insects as they call to each other. In the distance are strains of music and the occasional shriek of laughter coming from the beach at the lake in the center of the forest. Every once in a while I'd hear the high pitched whine of a fly or the medium toned buzz of a bumble bee. Once a dragonfly passed by with it's lower, lazy sounding hum. We picked mostly in silence, enjoying the morning. After we got home, I made a batch of blueberry muffins and set aside 4 cups of berries for the freezer. I still have 3 cups left over from 2013, which are going to get used up first. Everyone ate a few handfuls of berries and, with the remaining 12 cups of berries, I made 2 batches of blueberry jam with powdered pectin. I think this might be the first time I didn't use liquid pectin for this so I ended up having to use more blueberries in order to get enough jam to last us for the year. Or two. Who knows what next year's harvest will be?